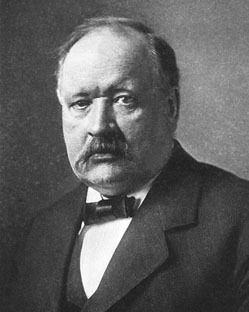 Swedish chemical physicist Svante Arrhenius taught himself to read at the age of three, and became a mathematics prodigy in childhood. He won the Nobel Prize in Chemistry in 1903 for work begun with his doctoral thesis, a groundbreaking theory on the dissociation of substances into electrolytes or ions, postulating that substances are partly converted into an active form when dissolved, and that this active part determines the substance's conductivity. He was the first scientist to describe the greenhouse effect, and is believed to have coined the term, predicting that rising levels of carbon dioxide (CO2) would cause the earth's temperature to rise. His equation showing the effect of temperature on reaction rates is still called the Arrhenius Law. He was also a proponent of "racial biology", part of the then-accepted science of eugenics.